Was The Power of Earnie Shavers Overrated? 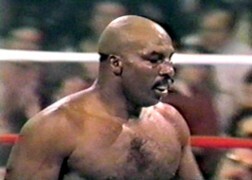 Earnie Shavers retired with a 74 (KO68)-14 (KO 7)-1 record and an impressive KO percentage of 76.4. Each year his awesome power seems to grow in legendary status, but I for one think it just might be a bit overrated. Sure, icing guys like Ken Norton, Henry Clark, Jimmy Young, and Jimmy Ellis is impressive, but knocking out Lou Bailey (17-35-5), Tommy Howard (2-17-2), (Charley Polite 913-21-3), Cleo Daniels (7-24), Johnny Mac (5-6), Art Miller (21-25-2), and Lee Estes (12-23-3) is quite something else. When Shavers stepped down, he usually chilled, but when he stepped up, he had only fair success and was chilled seven times. Still, he won almost twenty seven fights in a row by knockout and tallied twenty four first round wins.. He is rated tenth in Ring Magazine’s 100 Greatest Punchers. And below is Boxing Illustrated’s ten Hardest Punchers P4P of All-Time. Legend has it that Shavers split his glove open from the force of a hard punch he landed on Colombian Bernardo Mercado when they fought in 1980. What the story often fails to include is that Mercado went on to earn a seventh round technical knockout over the always dangerous, multiple-time world title challenger. In his previous fight, “The Acorn” had floored Larry Holmes with mind numbing shot, but still could not close the show and, as was the case against Mercado, was stopped in the later rounds. In 1977, he hit Muhammad Ali with a number of flush power punches, but Ali withstood the onslaught and won by 15-round UD. In one of the truly great fights ever, Shavers stopped a gassed Roy “Tiger” Williams after 10 rounds of incredible back-and-forth action in 1976. But this KO was more the result of an accumulation of punches than any single shot. In 1974, he iced Roy “Cookie” Wallace in one. However, this win was book-ended by losses to Bob Stallings (21-24) and Jerry Quarry (47-6-4). In 1975 in one of the greatest fight ever fought under the radar, Shavers (49-4-1 coming in) met rugged Ron Lyle in Denver. The “Acorn” had just come off three straight wins over limited Leon Shaw, Rochelle Norris and Oliver Wright, respectfully, but Lyle (30-3-1) was far from limited. Shavers decked Lyle in round two with two malefic left hooks and looked to close matters in the third, but Lyle regrouped and came storming back. In round four Shavers almost decked Lyle again after having been hurt earlier in the round. At this point, the crowd was going wild. In round five, Shavers gassed as is his wont, as Lyle then savaged him with sharp combos. Earnie came out for the sixth stanza seemingly groggy and Lyle wasted little time jumping on him with several consecutive shots the last of which cracked The Acorn cold and left him lying face down on the canvas. In what this article is all about, Ron Lyle snatched victory from certain defeat to knockout Earnie Shavers because Shavers could not close matters. As for Lyle, he would fight his classic battle with George Foreman in his next fight and would never be the same afterthat war. But on this night in his hometown of Denver, he was the MAN. After his stoppage loss to Mercado, Shavers won a ten-rounder against Leroy Boone. In another 1980 bout, he hit Tex Cobb with everything but the kitchen sink (in arguably his last high-profile bout), but could not do what Dee Collier later accomplished. He lost this brawl by eighth round TKO after being pummeled on the top of his shaven head non-stop. He then has success against moderate opposition (including a win over Joe Bugner on cuts) until he was out pointed by James Tillis in 1982 and again by Walter Santamore (17-10) that same year. In 1983, the power seemed all but gone as he went 10 successful rounds with one Robin Griffin (0-0 coming in). After being DQd against George Chaplin in 1983, he KOd Larry Sims (3-18-3) in one, but then, in an ill-advised comeback, he went the eight round distance against hapless Brian Morgan (4-20-1). His last fight was a humiliating first round KO loss to none other than Brian “B-52” Yates who retried with a less than compelling slate of 13-86-3. In retrospect, Earnie was a wrecking machine, but in many key fights against solid opposition, he was unable to execute a clean KO after he had staggered his opponent and seemingly had him on the brink. He seemed to lack that clean one-shot closer in the manner of a Bob Satterfield, Tommy Hearns, Wilfredo Gomez, Bob Foster, Alexis Arguello, Carlos Zarate, Gerald McClellan, Julian Jackson or even a prime Mike Tyson. There were many others I believe who are worthy of legendary status as one-punch KO artists– and that’s my point. The perception of Shavers being a great one-punch KO artist just doesn’t seem to square with reality. Maybe it’s time for a new list. Next post: Fight Night Party, How Do You Do It?